Every so often, a business will move just a few doors down, but with that resettlement causing an impact that affects every aspect of its existence. So it is for Earthbound Beer, which recently slid a few doors down, from a cozy, shotgun space 2710 Cherokee to an expansive one at 2724 Cherokee. The process of moving the operation was a massive one, with the brewery’s three owners – Stuart Keating, Rebecca Schranz and Jeff Siddons – taking on multiple tasks at once. 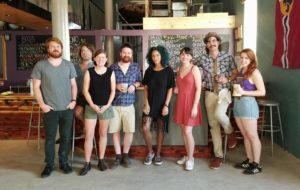 Over the better part of two years, each of them would spend a part of their day in their regular roles and a bigger part of the same day working on the rehabilitation of the new space, a one-time brewery itself. What’s in-place now, for the public, includes “two levels of seating and a tap room,” with up to 16 handles of homemade beer (as well as their perennial guest tap of Stag). Just as we were set to publish this, big news cam in the form of Mothership, the operation will be helmed by Chris Bork of nearby VISTA Ramen. A soft open of the concept will come on Earthbound’s third anniversary party on Nov. 17, with a full menu arriving within a fortnight after Thanksgiving. The Earthbound dining room, photo by Mabel Suen, of Feast Magazine. Inside, Siddons believes that the walls will start taking on more artistic touches, including, possibly, the inclusion of some artistic canvases, which would help dampen sound in this hard-surface-dominated venue. 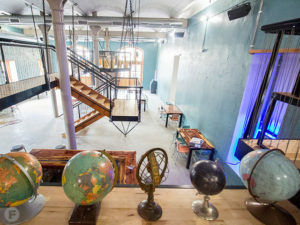 Some flags, a pair of pinball games and a large series of globes already hint at some of the design elements that may start appearing in greater number, as the business grows into itself. The next calendar year should also see a big change in the brewery’s ability to ship products to market, with a canning line slated, to be located in the huge network of tunnels and work chambers below the brewery. Almost needless to say, that’ll require a heady outlay of cash and effort and “will be the next big step in production.” In the short-term a sought-after crowler machine will soon allow folks to take some Earthbound home with them. The tap room, though, is already kicking and features a limited selection of wines and spirits, in addition to, obviously, the craft beer produced onsite. The early feedback, Siddons says, has been positive.